FRISCO, Texas (July 20, 2018) — US Youth Soccer is pleased to announce the 96 referees who, based on their performance at the state and regional level, will be officiating the games at the 2018 US Youth Soccer National Championships, July 24-29 in Frisco, Texas. The selection process for referees for the US Youth Soccer National Championship Series is based on performance throughout the Series. Just as the teams advance from the state to regional to national level, so do the referees. The United States Soccer Federation is sending referee assessors to Frisco, in addition to several US Youth Soccer assessors. The referees are an integral part of the US Youth Soccer National Championship Series, and they play a key role in its success and advancement to the next level. Being invited to the national level is a great honor for these referees who are dedicated to promoting fair play and furthering their development. This year, 20 top referees will be returning to work at their second consecutive US Youth Soccer National Championships based on their performance at last year's tournament. Referees participating in the 55 US Youth Soccer State Association State Cup events are considered for advancement to participate in one of the four US Youth Soccer Regional Championship events. The top referees from each regional event are then considered for advancement to the National Championships. Once selected to the National Championships, the top referees are identified and invited to return to the event the following year. 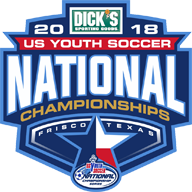 Each summer, the US Youth Soccer National Championship Series crowns the boys and girls National Champion in seven age groups (13U through 19U). The finals are a culmination of a year-long series of competitions at the state and regional levels which provides approximately 185,000 players on over 10,000 teams from 55 US Youth Soccer State Associations the opportunity to showcase their soccer skills against the best competition in the nation. One of the 14 national crowns awarded is the 19-and-Under James P. McGuire Cup, the oldest trophy in youth sports, dating back to 1935 with the inaugural youth championships, and played annually except during World War II. Officially known as the United States Soccer Federation National Junior Challenge Cup, the competition was renamed the James P. McGuire Junior Champion Cup in 1975, after the late United States Soccer Federation President.